Beach at Short’s Point in Fintry Provincial Park on the shore of Okanagan Lake in Fintry, British Columbia, Canada. 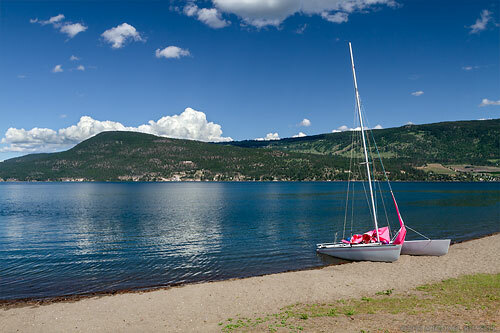 This beach scene from the Short’s Point area of Fintry Provincial Park would have been rather mundane if someone hadn’t left their catamaran sailboat on the shore for me to photograph. I spent some time walking along the beach at Fintry looking for compositions but didn’t walk all of it – the Fintry beach is 2km long! View more of my photos from the Thompson Okanagan.